Our cosy ‘snug’ bedrooms have a warm homely feel. These rooms showcase a large double bed, Egyptian cotton sheets and wool throws. The bathrooms feature a traditional bath with an over-head shower, washstand and heated towel rail. Our Snug rooms are equipped with a flat screen TV, tea & coffee making facilities, free superfast Wi-Fi and Noble Isle bath and body products. Our luxury rooms offer extra space in which to unwind and relax. All rooms are well furnished with large king sized beds and Egyptian cotton sheets. Each room has a traditional bathroom with a shower over bath, washbasin and heated towel rail. All rooms feature a flat screen TV, tea & coffee making facilities; free superfast Wi-Fi and Noble Isle bath and body products. This luxury suite is perfect for honeymooners, families and those looking for that something extra. Our suite is both large and luxurious. 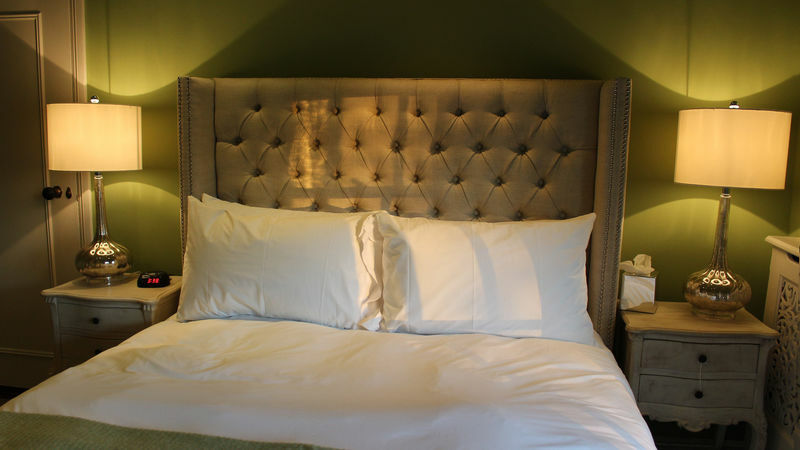 The room is full of relaxed charm, exquisite fabrics and subtly furnished with attention to detail. The separate lounge has a large sofa and antique coffee table perfect to wind back and relax during your stay. This light and airy bedroom has a beautiful view of the village green. The bedroom has a huge king sized bed with a spacious en-suite featuring a antique bath and overhead shower, washbasin and heated towel rail. The suite is equipped with two flat screen TV's, tea & coffee making facilities; free superfast Wi-Fi and Noble Isle bath and body products. The perfect room for you and your family. This suite features two linked bedrooms (Sleeping 4). The master bedroom features a king sized bed and the ‘kids’ room is fitted with bunk beds. A large en-suite bathroom features a modern bath with an overhead shower, basin and heated towel rail. Both rooms feature traditional, antique furniture and luxurious beds. This room features a flat screen TV, tea & coffee making facilities; free superfast Wi-Fi and Noble Isle bath and body products. An extra charge of £15 per night will be added to the final bill. Unfortunately, children and infants are not able to stay in rooms 3,8 and 10. Children : An extra charge of £15 per night will be added to the final bill. Unfortunately children and infants are not able to stay in rooms 3, 8 and 10. Pets : An extra charge of £15 per night will be added to the final bill. For bookings in excess of three rooms, full payment is taken at the time of booking. Booking.com and Expedia reservations doesn't includes breakfast.